For our December feature article, Dr Jo Laycock of Sheffield Hallam University writes for us. As the 25th anniversary of the Armenian Earthquake approaches, she offers us a story of disaster and relief at the end of the Cold War. At 11.41 am on December 7th 1988 an earthquake measuring 6.9 on the Richter Scale struck the Soviet Republic of Armenia. The Spitak earthquake, as it became known, devastated the towns and villages of the north west of Armenia. Early reports from the disaster zone by the United Nations Disaster Relief Organisation (UNDRO) painted a bleak picture, describing the town of Spitak as ‘utterly destroyed’ and the nearby town of Leninakan (Armenia’s second city, now Gyumri) as ‘30% destroyed’. Initial estimates of the death toll were as high as 100,000 but were revised to 25,000 in the months following the disaster. A further 500,000 Armenians were made homeless by the disaster. The sheer scale of the disaster meant that for the first time since the famine of the early 1920s Moscow requested international assistance. A massive relief operation was undertaken, drawing in specialist rescue teams from France, Britain and Switzerland along with humanitarian organisations including the British and American Red Cross societies and Médecins Sans Frontières. The initial media frenzy and relief operation was followed a year later by Rock Aid Armenia’s charity cover version of Smoke on the Water. However, this episode of ‘celebrity humanitarianism’ failed to capture the British public imagination in the same way that Band Aid’s ‘Do they know it’s Christmas?’ had done five years previously, and the quake disappeared from the headlines. 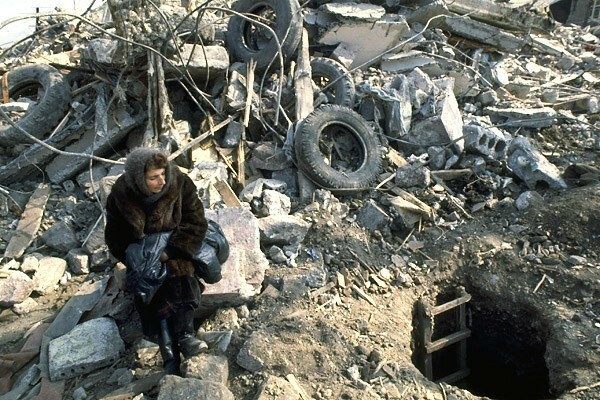 Twenty five years on the after effects of the earthquake are still deeply felt in the independent Republic of Armenia. In Spitak, Gyumri and surrounding villages lives have been profoundly shaped by the loss of loved ones and the destruction of homes and livelihoods. 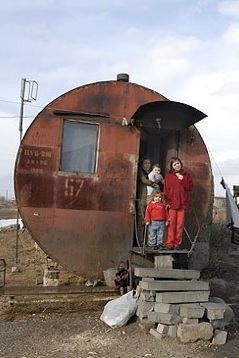 The problems faced by the region have been compounded by the failure of successive post-Soviet Armenian governments to adequately resolve the housing crisis caused by the earthquake. Even two decades after the crisis thousands of Armenians were still housed in ‘domiks’ – temporary shelters made from shipping containers. Although some steps forward have been made in the last few years, serious housing problems still persist today. Although the quake and its aftermaths faded from international public consciousness soon after the initial moment of crisis had passed, for humanitarian and disaster relief practitioners the disaster attained iconic significance as a ‘turning point’. As Didier Fassin and Richard Rechtman explain in The Empire of Trauma: ‘In the medical literature emergency specialists so frequently refer to the Armenian earthquake of 1988 that it has become a code word for disaster second only to the attack on the World Trade Centre’. The response to earthquake has thus been seen as a key transition point between two distinct phases in humanitarian history – the ‘pre’ and ‘post’ Cold War. Furthermore, it has been framed as an episode from which instructive lessons about the practice of relief after large-scale disasters could be learned. My current research considers the extent to which such assumptions about the Armenian earthquake as both turning point and lesson reflect the realities. It examines local and international emergency response to the quake and the complex aftermaths. Examining this case from a historical perspective, I suggest, can provide new insights into the transnational history of humanitarianism. In particular, it offers the potential to develop critical insights into the transformations in humanitarian institutions and practice that the end of the Cold War is thought to have wrought. Besides offering insight into the history of humanitarian practices associated with the ‘West’, considering the response to the earthquake fully demands an examination of the Soviet responses to disaster in Armenia. In turn, this raises important questions regarding the place of the Soviet Union in emerging transnational histories of humanitarianism, a neglected subject in most of the existing literature. Because it occurred at a time of rapid change in relations between the ‘West’ and the Soviet Union the Armenian earthquake captured the imagination of the Western media. The idea of the iron curtain dissolving in the face of humanitarian need was thus central to media coverage of the earthquake. 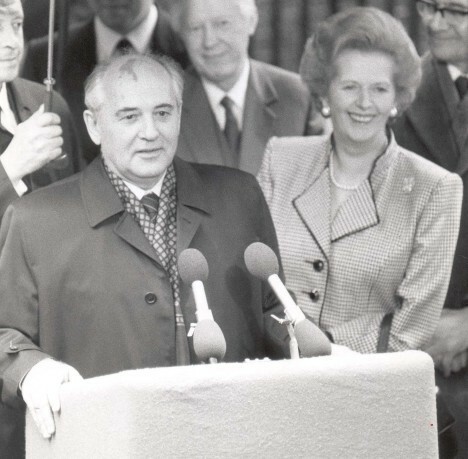 In Britain it was usually expressed in terms of a personal connection between Gorbachev and Thatcher, and in a twist on the model The Daily Mirror expressed the Queen’s personal distress at events in Armenia. Nonetheless, British press coverage of the disaster was still framed by the rhetoric of Cold War rivalry. Lists of aid sent by various countries to the Soviet Union occupied many column inches. The Daily Mirror listed aid arriving from Britain, Holland, France, Italy, Germany, Belgium, Cuba and Turkey, a similar list made the front page of The Times. Providing aid to the Soviet Union had become a source of international pride. This was a striking contrast to the 1920s when providing aid to Armenians in the Soviet Union was a highly sensitive subject, and appeals for aid for Armenian refugees in Save the Children’s ‘News from the Stricken Lands’ feature in their publication The World’s Children studiously avoided informing potential donors that Armenia was a Soviet Republic. In ITN reporting, the superhero-esque blue jumpsuits of the international rescue corps contrast sharply with the greyness of a local population who shuffle around the wreckage of the city. Interviews meanwhile explained that the rescue corps could be self-sufficient for 14 days, needing only to find water. Rescuers equipped with specialist technology were contrasted with the inhabitants of the earthquake struck towns and villages. The Mirror reported that a ‘crack team’ of British Firemen would travel to Armenia, taking with them ‘a new invention…which can detect even a heartbeat in the wreckage’. In contrast an ITN report featured an Armenian women, bundled up against the cold in a bleak field, mourning the loss of her cow. Her words ‘she used to feed us’ were translated. Whilst this may be read as a poignant vignette of personal loss, it also underscored for the British public the primitiveness or backwardness of life in a Soviet State. ‘all the barriers fall down when humanity is in need or distressed. I think this is a very good example that there is something which binds us all together, deeper than the things which divide’. A year and a half later Thatcher opened the Lord Byron School, funded and built by the British government and British businesses in Gyumri, one of the towns worst hit by the earthquake. That the opening of the school was deemed worthy of a visit to a Soviet Republic by the British Prime Minister is indicative of the strategic importance attached to the British role in the Armenian relief effort. Without a doubt the international response to the Armenian earthquake was a ‘first’. It effectively opened up the former Soviet Union as a new sphere of humanitarian action in which, over the next two decades, the major relief and development agencies would prove to be very active. However, venturing across the iron curtain entailed an encounter with new kinds of problems and different styles and practices of relief, which exposed cracks and flaws in the international humanitarian system. Whether or not the international relief effort represented the cutting edge of rescue technology as the media suggested, it was of little use without proper planning and coordination. By the time many of the rescue teams arrived it proved to be too late to save many lives and much of the aid that was donated proved to be unusable, out of date medications and non-compatible medical equipment. In the aftermath, appeals for the improved planning and coordination of disaster response would become common, but to what extent ‘lessons were learned’ from the Armenian experience remains a difficult question. Western coverage of the earthquake and its aftermaths framed the inadequacies of the Soviet relief operation as a function of the wider failures of the Soviet system. In Armenia too, in the immediate aftermath of the earthquake, critiques of the Soviet relief operation were incorporated into calls for the end of Soviet rule. In some cases blame for the quake was directly attributed to the Soviet authorities – a popular Armenian anecdote in those years asked how Moscow would punish the nationalities that did not live in seismic zones. Interpreting responses to the earthquake in this way was clearly one way of making meaning in a time of crisis and upheaval, but from a historian’s perspective continuing to interpret disaster and relief through this late Cold War is problematic. Maligned as they were in the Western press, the local and Soviet responses also played an important, if imperfect, role in post-earthquake relief and reconstruction and warrant further critical analysis. Interpretations of the Armenian quake which take for granted the nature of the Soviet response are not particularly surprising. In general the Soviet Union tends to be absent from histories of humanitarianism and disaster relief. Indeed, if the Soviet Union is mentioned at all it tends to be as a cause of crisis rather than as an active agent in the field of relief or the management of disaster. Nonetheless, throughout the twentieth century, the Soviet authorities faced with crises both ‘natural’ and ‘man made’. Critically examining their response to disaster in Armenia provides a way to start to fill this gap in the scholarship and develop more nuanced understandings of both the meanings attached to disaster in the Soviet system and the techniques and practices that were employed in response. This entry was posted in Features, Jo Laycock, Reflections and tagged disaster relief, humanitarianism, transnational histories. Bookmark the permalink. I remember that time well. I started a massive collection which culminated in a surge by volunteer scouts from Dorking Scouts (which I used to be involved in) to help to fill a giant Russian Antinov aircraft at Heathrow Airport. It was to be filled with tons of blankets, fur coats tents etc which had been collected within Gloucestershire and marked up with mock Russian Language labels hastily constructed by my colleagues at the then Nuclear Electric at Barnwood. A fascinating time – I remember a man called Peter Pdrorian with whom I spoke in Armenia. Hope we can speak sometime?